Traffic in Albany: A mandatory state road user fee by 2025 has not advanced in the legislature. Legislators seem to be in no hurry to expand OReGO, the state’s per-mile road tax program, or to make it mandatory in a few years. A bill to do both was heard by the House transportation committee on March 15 but has seen no action since. Only two people, representatives of Metro and AAA Oregon, signed up to testify for House Bill 2464. The ODOT manager in charge of the program also testified but said she was “neutral” on the bill. The 2013 legislature authorized the road-user fee for up to 5,000 vehicles, and volunteers could sign up for the start in July 2015. Participation never got close to the limit. Between 1,200 and 1,300 vehicles have been signed up. The way it works, volunteers can choose one of three kinds of gizmos to plug into a port on their vehicles. The devices record the miles driven and gallons of fuel consumed. The owners are charged a road-user fee of 1.5 cents per mile, and they get credit for the 30 cents per gallon of fuel they have paid at the pump. Once the fee or the credit hits $20, they get either an invoice or a check in the mail. I signed up for the program to see how it works. As it happens, the F150 I’ve signed up for the program uses fuel at a rate where the road fee and the gas tax are just about equal. The truck has been plugged into the program for a year, and I now have a credit of $2.39. Oregon started the program because, in the words of OReGO’s Maureen Bock, the “fuels tax will no longer remain viable as more fuel efficient and electric vehicles use the roads.” And that’s why the transportation department’s Road User Fee Task Force proposed House Bill 2464. The measure would lift the cap of 5,000 vehicles and, more significantly, make the mileage fee mandatory in 2025 for all light-duty vehicles of model year 2026 and later with a fuel economy rating of at least 20 miles per gallon. Bock told the transportation committee that to prepare for 2025, ODOT would develop a mechanism for manual mileage reporting, consider new reporting technologies, and study enforcement methods. Unless I’ve missed something (please correct me if so), a fatal flaw is obvious: charging only by distance ignores the huge effect on road wear by vehicle weight. 1 – Mileage fee which depends on the best estimate of road wear by vehicle model (weight, number and size of tires, etc). Purpose: road maintenance. If you can figure out a way of dealing with studded tires, do it. 2 – Congestion fee wherever and whenever it’s useful and feasible, with discounts for multiple passengers. Purposes: pay for road expansion, reduce the need for road expansion. Additional benefit: immediately improve driving time. It might also make road building costs fairer to rural drivers since it would apply mostly to urban areas where land and building costs are higher. Another flaw: Most of my miles, when I drive, are for travel outside of Oregon. How would that be considered? And, this is the first I have heard about such a strange plan. There must be something better. I am all for improved road maintenance and bright expansion of our transportation system. 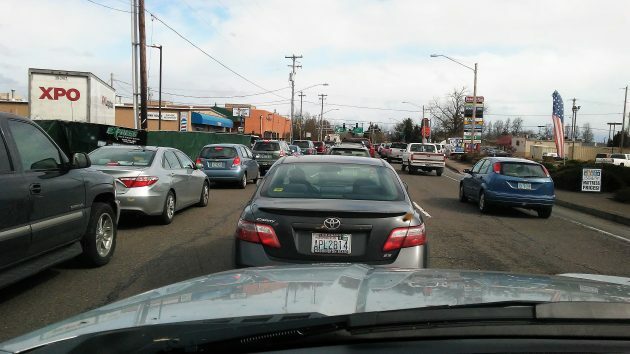 Another stupid idea is adding more lanes to U.S. 20 between Albany and Corvallis. I avoid highway 34 because it seems like a straight racetrack. Participants in the program can choose a GPS-based system that records only miles driven on Oregon highways.